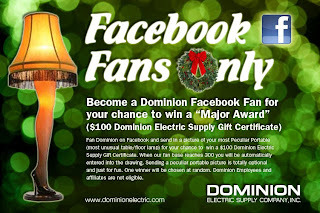 Become a Dominion Facebook Fan for your chance to win a "Major Award" ($100 Dominion Electric Supply Gift Certificate). Fan Dominion on Facebook and send in a picture of your most Peculiar Portable (most unusual table/floor lamp) for your chance to win a $100 Dominion Electric Supply Gift Certificate. When our fan base reaches 300 you will be automatically entered into the drawing. Sending a peculiar portable picture is totally optional and just for fun. One winner will be chosen at random. Dominion employees and affiliates are not eligible. If you're already a fan, you can speed up the contest by having YOUR friends become fans. Here's how you do that: Log into your facebook page, go to your fan pages, select Dominion Electric Supply (so you have to be a fan first) and click the link under our picture "Suggest to Friends" then it automatically sends out the suggestion to all your friends. Pretty cool.